As our research shows, the Industrial Internet is already here, delivering real benefits including improved operational efficiency, flexible work experience and measurable business outcomes. At the same time, our research participants have also pointed out a number of challenges that could potentially slow down the pace and increase the risks of adoption, which include security, interoperability, data policies, and education and talent gaps. To seize the opportunities, overcome key challenges and accelerate the Industrial Internet development, business, technology and government stakeholders need to take immediate actions (see also Figures 6 and 7). 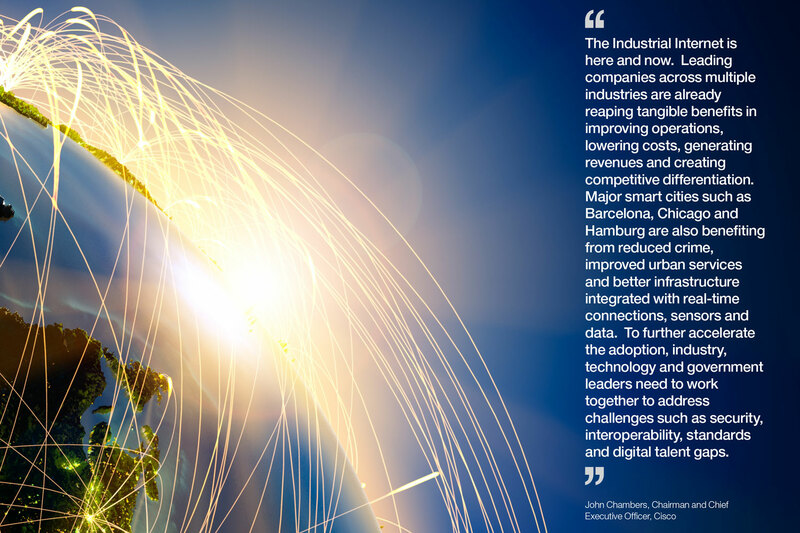 Reorient the business strategy around the Industrial Internet. Businesses need to evaluate how the shift to an outcome-based economy will disrupt their industry and alter their overall strategies. Where is the industry at right now within the four-phase Industrial Internet evolution model (from products to services to outcomes to the pull economy)? When is the next inflection point? Adopters of the Industrial Internet should develop multiple scenarios about alternative futures and map out the company’s possible responses. They must identify the processes and organizational structure required to achieve long-term success. For example, consider how the operational efficiency-focused phase (e.g. asset utilization) can set up the company for later success. Develop a clear roadmap for how to transition between each of the four phases. What are the implications for existing assets and buyer behaviour? What are financial implications of moving from selling products and service agreements to selling outcomes? Orchestrate the organization’s ecosystems. Businesses need to understand the critical importance of ecosystems in the deployment of the Industrial Internet. Multiple providers are required to deliver complex outcomes and share costly investments. If the company has a number of product lines, it must first determine which ecosystem(s) the company should lead, and where it should play a supporting role. What kind of partners will the company need to boost capabilities and deliver the desired outcomes? Are today’s partners still the right ones for the future? What does the business need to do to be an attractive partner? Should the business invest in building its own platform (e.g. MyJohnDeere), or join an existing platform to achieve success within the desired timeframe? Whom should the company partner with to move to the next phase while reducing risks? Companies need to look across industry boundaries for emerging opportunities and find the potential partners who will help seize them. Identify pathfinder projects that the business can drive now. One approach would be to start now with 1-2 validated business cases (e.g. preventative maintenance) to drive near-term measurable benefits for the organization, such as cycle-time reductions, cost savings and business process improvements. Companies may want to balance these implementations with some riskier but low-cost pilots with innovative start-up solutions to provide the valuable learning and insight required for the new strategy. They need to focus on solutions that have new business model implications, such as product/service hybrid or outcome-based services. What are the infrastructural, organizational and legal requirements for conducting such pilots? Can they obtain support from vendors or governments as an early adopter? Advance interoperability through test-beds. Technology providers need to develop real-world test-beds to demonstrate how technologies from different organizations can work together to support new use cases and product concepts at scale and at speed. Participating in test-beds gives these companies a direct voice in shaping future Industrial Internet products and services. It will also provide them early mover advantage as they gain a better understanding of the requirements, trends and possible timing around potential market disruptions. Because successful test-beds require close collaboration among stakeholders, they can be an effective way to bootstrap connected industry ecosystems and platforms – two critical components for an outcome economy. Share best practices through a global security commons. Operational safety and security practices vary greatly across industry domains. They are also significantly different from IT security. For example, human factors engineering is critical in ensuring safe operations. The first step towards building a common security framework for the Industrial Internet is to understand and document existing best practices across industries. This will help identify gaps and requirements for potential innovation, standards or new cybersecurity products. A global security commons provides one practical way to bring together these communities by involving key stakeholders across the Industrial Internet value chain. The commons can help raise the collective security awareness by sharing threat intelligence. It can also ensure a unified industry voice when communicating with governments or agencies involving security. Cultivate brownfield innovation. Industrial products are durable goods “built to last” for years if not decades. Technology providers need to change their “planned obsolescence” product lifecycle mind-set to focus attention on supporting equipment that is now in the field. What sensors or devices can be added without compromising the integrity of the existing machinery? What parts (hardware or software) can be upgraded incrementally? Consider what new value-add services can be provided to make today’s equipment and facilities more productive and efficient, or how adding intelligence to existing products opens up new outcome-based opportunities. Help adopters address market opportunities and risks. 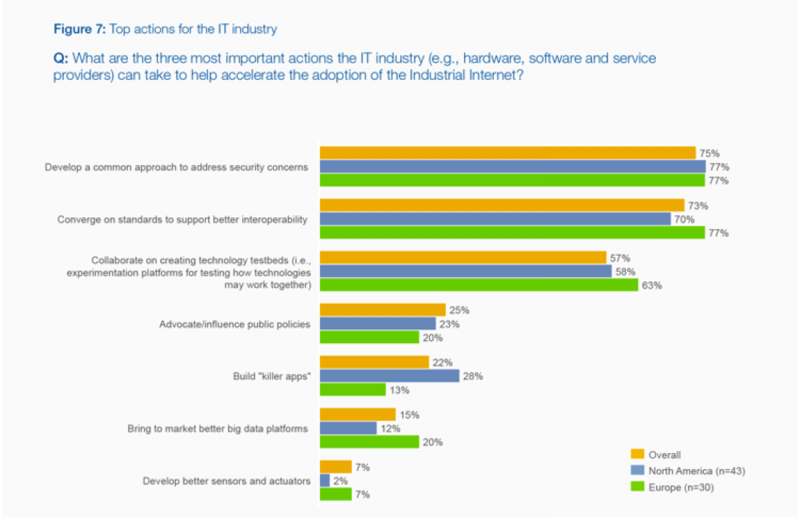 The Industrial Internet market is still in a formative stage. So, many potential adopters need to develop a clearer picture of the landscape before they drive through it. It is important to share with them best practices, winning use cases and operational models with customers to get them started in their Industrial Internet journey. What benefits have been demonstrated so far? What are critical barriers (e.g., IT/OT integration, security) that need to be overcome early in the process? What are lessons learned from past implementations? Providers need to think, too, about the most effective ways to share early adopter experiences, such as by leveraging industry consortium like the IIC or events like the IoT World Forum. Clarify and simplify data policies. To realize the promise of the Industrial Internet, global companies need clear legal guidelines over data ownership, transfer and usage. Who owns the data generated by equipment? What information can be shared or sold, and under what circumstance? How will responsibilities among parties be handled when the data originates in one jurisdiction and is used in a different one? In complex global organizations, it is often more difficult to segregate Industrial Internet data than that of consumer Internet based on national boundaries. Until the full impact is better understood, it would be prudent to introduce temporary policies to guide the market and spur innovation. Governments need to collaborate with each other and industry to harmonize compliance requirements in data and liability laws, as the European Commission and the United States are doing on message standards. This will streamline data flow within a jurisdiction and across national boundaries – an issue critical to large, global organizations. Update industry regulations. Some industries, such as utilities and healthcare, are heavily regulated in many parts of the world. For these industries to benefit from the Industrial Internet, policy-makers will need to revisit and possibly relax existing regulations to provide more flexibility and incentives for companies to invest and innovate. In the utilities industry, governments can now tap into the new power of transparency enabled by the Industrial Internet to encourage more competition, market efficiency and better customer services. Motor vehicle, aviation and workplace regulations may require adjustments to allow experimentation with autonomous cars, unmanned aerial vehicles and robots in warehouses, factories and hospitals. Policy-makers should also review whether insurance regulations will support or hinder the growth of an outcomes guaranty insurance market. Invest in digital infrastructure. The success of the Industrial Internet depends heavily on the presence of robust infrastructures, such as ubiquitous broadband connectivity and sensors. Through targeted investment, emerging markets will have a unique opportunity to potentially leapfrog developed countries in the Industrial Internet infrastructure. As these countries continue large construction efforts like roads, airports, factories and high-density buildings, they can avoid costly retrofitting faced by developed countries by installing state-of-the-art embedded sensors from the outset. These capabilities provide a foundation for smart cities, enabling more efficient use of natural resources, better public safety and citizen services. Industry can help government leaders to prioritize infrastructure investments that can provide long-term strategic benefits to economic growth, social impact and political success. As part of the Smart Nation infrastructure, for example, Singapore is considering installing Above Ground Boxes as key supplying points for backend fibre access and power. This approach avoids the need for unnecessary groundwork and thus significantly reduces sensor deployment time and cost. Raise awareness among public policy-makers. 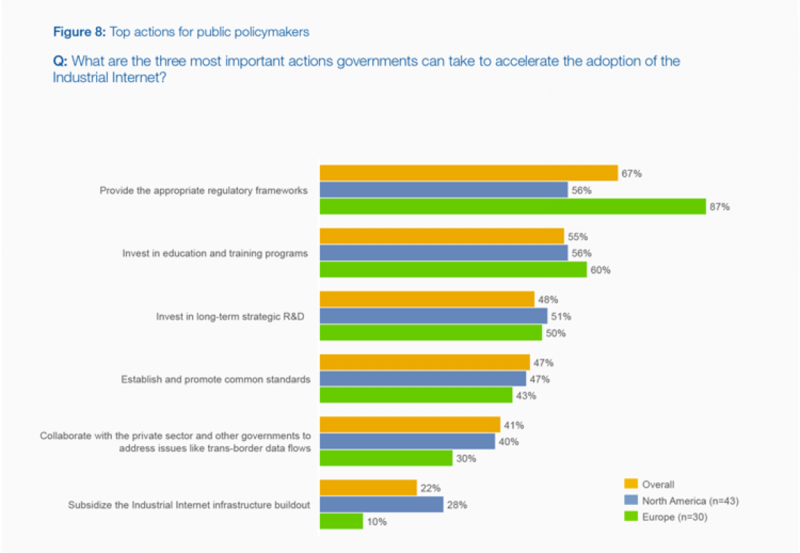 Many policy-makers are still not well informed about how the Industrial Internet might impact citizens, industries and governments, and what governments can do to promote the market development and economic growth. There is an urgent need to bring them up to speed on the technology, its societal and policy implications (such as data security, privacy, education and jobs), and impact on government services. For example, the German government was one of the first to recognize this need, and has sponsored the Industrie 4.0 initiative, which includes specific recommendations for German regulators as well as industry to promote the growth of digital industries in the country. Invest in long-term, strategic R&D. 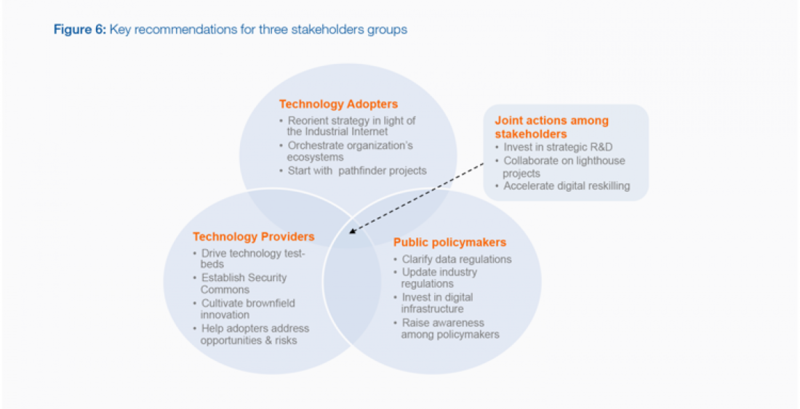 The future development of the Industrial Internet will require large scale multistakeholder efforts in boosting security, reliability and interoperability, and in delivering large-scale societal benefits (e.g. smart transportation). In particular, security is one issue that no one industry, business or government can solve on its own. To address these challenges, frontline contributors will come from academia and industry. Government agencies will play critical roles as well. How can they support technology transfer from labs to industry, as the US National Science Foundation’s Innovation Corps has done? Funding research into Industrial Internet technology and applications is another option, as the UK government has done. Funding needs will vary significantly by region and maturity, so executives and academics must proactively communicate both current and anticipated challenges. Collaborate on lighthouse projects. To accelerate the uptake of the Industrial Internet, all stakeholders must come together to create large-scale demonstration projects to show how the technology can be used to deliver tangible benefits. Unlike test-beds, which focus heavily on technological issues like interoperability and security, the purpose of these lighthouse projects is to demonstrate the real-world impact by enabling people to experience it at first hand. Many technology providers are already conducting such joint projects. For example, Intel has partnered with the City of San Jose, California, to test its Smart City platform to support San Jose Green Vision initiative. While the initial focus is on air quality, the future plan calls for the use of the same platform to improve the quality of a number of other services, including water, transportation, energy and communications systems. Beyond smart cities, similar projects can be organized around other areas of societal importance, such as healthcare, transportation, food safety and education. One important benefit of these collaborative efforts is the resulting broader awareness among the general public on the vast potential of the Industrial Internet, which will ultimately lead to higher pent-up demand for new smart services. Accelerate reskilling to meet changing talent needs. The convergence of physical industries and digital technologies will exacerbate the talent gap, especially among workers with both OT and IT skills. The Industrial Internet requires analytical talent, including data scientists, yet most of our research participants agree that current education and training approaches are not up to the challenge. To address the growing shortage of digital talent, industries and academia must come together to define and implement new educational and training and reskilling programmes – both in the classroom and online. For instance, consider pilot programmes where elementary students can work alongside machines or experiment with Arduino boards or littleBits electronic prototyping kits. Governments should consider policy incentives to encourage businesses and individuals to reskill to fill in the talent gaps in high-demand job categories.